TO THE NEW is on a constant quest to pick the brains of top industry experts. Here is the one we have recently picked and wanted to share. 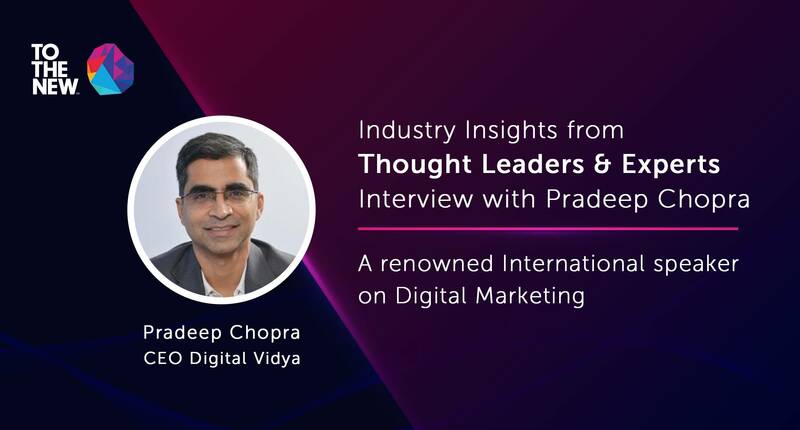 Interview with Pradeep Chopra, a renowned International speaker on Digital Marketing and CEO at Digital Vidya. About Pradeep: Among the pioneers of Digital Marketing, Pradeep has been part of the Internet Industry since 2000. He has been a serial entrepreneur for last 17 years and is currently a Co-founder & CEO of Digital Vidya, a leading Digital Marketing and Big Data & Data Analytics training company. A graduate of IIT Delhi and a recipient of Adobe Content100, Pradeep is one of the most sought-after international speakers on Digital Marketing and Entrepreneurship. Being one of the pioneers in digital marketing you have helped many professionals and CXOs to solve their digital marketing challenges. What are some of the common challenges that the companies are facing across industries? Finding Talent: Given this industry is still evolving, finding right talent is one of the most difficult tasks. Finding Agency Partner: The entry barrier to form an agency is too low. Moreover, organizations don’t have sufficient understanding of what to expect/not from agencies. Finally, working with agencies as a vendor (vs partner) is another reason for significantly higher failure rates. Using measurability to its advantage: While measurability is one of the key advantages of digital marketing, yet it’s not used to its advantage. Even today, how to measure ROI of digital marketing is an unsolved puzzle for a large number of organizations. How do you see Digital Marketing is impacting enterprises in India? What are top trends you see are entering the marketplace? I would want to replace Digital Marketing with Digital Media here as the contribution of new media is beyond marketing such as customer insights and loyalty. Given the majority of organizations have their stakeholders, which include customers, employees and partners all present online, not using digital marketing is no more an option. Video content has become the most popular part of a Social Media Campaign. Nothing is as much catchy and attractive as a video content is. What kind of content must a marketer highlight to garner maximum attention of the viewers? Yes, we’ve seen a shift happening from text to image to video. The success of any content including video relies on the fundamental aspect: is your content fulfilling the objectives of your target audience? followed by your ability to distribute the content to right audience. Unfortunately, many organizations treat digital marketing as a technology function and the core of understanding of the customer is not being used in their communication. 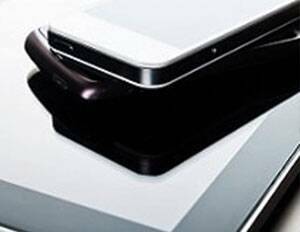 The same is reflected in Video Marketing. With all the companies incorporating the latest technological advancements into their digital media campaigns, what will help organizations stand out and differentiate themselves from the competitors in the long run? Firstly, one needs to understand that technology is a means to an end and not the end in itself. As I shared earlier, the ownership of digital marketing should stay with people who own the customers. If this is not in place then nothing including technology advancements will make any meaningful contribution. The agility to experiment will be the key to operationalize technology functions. People are getting bombarded with content and advertisements. In such competitive space, what is the right way to get your target audience eyeballs on your content? As I shared earlier, knowing who your target audience is, what they expect and be ability to reach out to them are the key elements of any marketing communication. For the same reason, we spend a good amount of time in teaching how to create an Integrated digital marketing in our digital marketing certification course. According to you, what are the top 3 mistakes committed by organizations today in leveraging Digital Marketing? Between, agencies and in-house, which approach would you recommend for the maximum value of Digital Marketing? Why? Both the approaches are fine and in many cases organizations chose a hybrid approach. In-house is an ideal choice if the leadership team has the capability to manage the digital marketing strategy. Alternatively, the organization must bring in a digital marketing champion, who can then further build in-house capabilities or work with an external agency. As I shared earlier, when working with an agency, the organization must work with their agency as their partner (vs a vendor). Moreover, even when working with an agency, the key marketing person should manage the overall digital marketing strategy. Would you like to share few words about the Digital Marketing and Analytics services at TO THE NEW? TO THE NEW is now one of the thought leader covering the entire spectrum of digital technology, marketing and analytics space. They have built a strong team of digital mavericks who are doing a great job helping businesses with an integrated digital marketing strategy that impacts the bottom line for businesses across the globe. How do see virtual and augmented reality impacting SEO? Interesting question, I recently authored this article on SEMrush about the opportunity of Augmented Reality for SEO. It’s really good and inspiring! Pradeep Chopra is the Co-Founder and CEO of Digital Vidya, one of the top digital marketing training institutes in India.